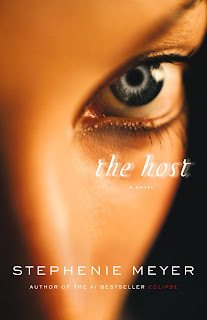 So I read "The Host" by Stephenie Meyer awhile back after I of course read the twilight series. Which I have to say, the Edward in the book was so so so much hotter than the Edward in the movie. The reason I decided to review "The Host" is because the movie just came out on DVD and I watched it for the first time on Thursday. 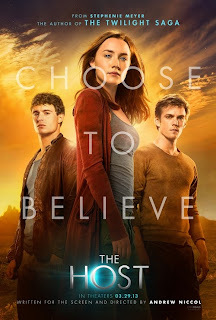 I must say that when it first came out in theatre I was very sceptical and thought it was gonna be another Twilight disaster, but to my surprise, it actually followed the book, although it left out some important parts. But it is still a good movie and an even better book. "Melanie Stryder refuses to fade away. The earth has been invaded by a species that take over the minds of human hosts while leaving their bodies intact. Wanderer, the invading "soul" who has been given Melanie's body, didn't expect to find its former tenant refusing to relinquish possession of her mind. Featuring one of the most unusual love triangles in literature, THE HOST is a riveting and unforgettable novel about the persistence of love and the essence of what it means to be human." So yes, basically this book is about alien souls, who can invade a person's body and take over their life. It starts off with the human population just about gone, except for the lucky souls who have remained hidden from the seekers. Wanderer was given Melanie's body, and discovers that Melanie is still in there and showing her memories of people she loves. Wanderer isn't supposed to feel human feelings, but she can and they open up a whole new side of thinking. When they stumble upon the humans Melanie knows, all hell breaks loose and everyone has to start rethinking everything about these alien souls. I loved this book and can't talk anymore about it because I don't want to give it away. I will say the movie didn't disappoint me like the twilight one's did and this follows more closly to the flow of the book. Most people didn't like the movie, but if you asked anyone who read the book first, I would say that you would get a more positive reaction. If you love the theory of Aliens and the taking over of bodies, along with adventure you shouldn't pass up this book, which is so much better than twilight.